You know when you're really exhausted but you force yourself to stay up to finish some assignments and then you just reach that point of no return - godforsaken insomnia? I'm at that point. Not sure why blogging seems to be the most viable thing to do at this hour because I really cannot form coherent sentences when I'm running on five hours of sleep on any day... but uh, here's my attempt at a post. My apologies if I make no sense. Weekend was filled with loud music and food! The outfit pictured above is what I wore to the Sun God festival in San Diego - it was great, and Jimmy Eat World even better than great :). Watching them live, after years of yearning to catch them perform just one song, was surreal. They were my favorite band in middle school and seriously brought me through my years of teenage angst/puppy love heart break haha! Jimmy Eat World was amazing, to say the least. Nostalgic goodness. My music-infused weekend ended yesterday with a 7-hour concert at Wango Tango in downtown LA. I thought I had quit Wango Tango for good two years ago but when my sister told me she won front-row (pretty much) tickets to the show, I couldn't resist. Definitely a great experience getting to be SO close but I'm not sure if I can handle a bajillion girls screaming their hearts out for new Bieber lookalikes (Cody Simpson?) anymore. you look stunning as always, amazing combination! New/Old post on my blog. Omg.I love your outfit,I think it's absolutely amazing! what a great leather vest and i love all the layering over the dress! I really love the way you layer. Sooo pretty! love this look! and the color red is stunning on you! Wow you have REALLY pretty hair! Insomnia is the WORST. And it always seems to strike at the most inopportune times! Like when papers are due! I can't believe you saw Jimmy Eat World! They were one of my favourite bands in highschool too! I went to see them so many times around when Bleed American first came out and they were still playing small venues. So many amazing memories of those shows! I would love to see them again! So jealous! Love that dress too BTW! I love all the vintage items in your outfit. 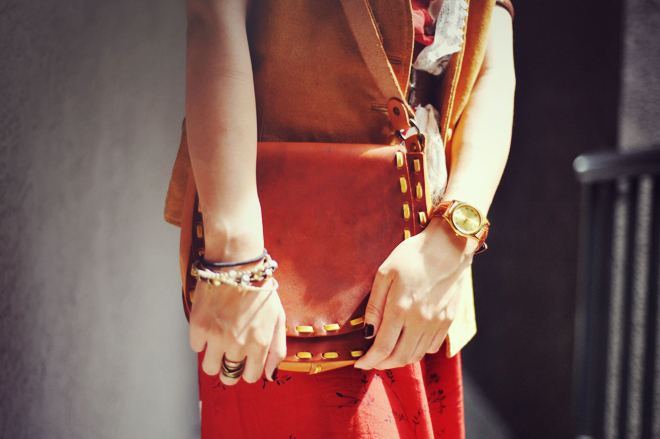 The rugged leather best, the rich floral dress, and the stitched saddle purse are all such beautiful pieces. Sounds like you had a fun-filled music weekend! Get some rest, hun! 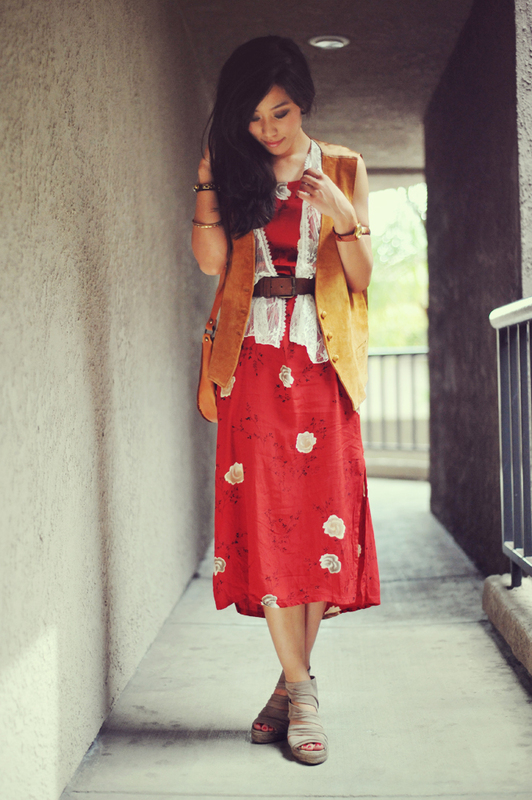 love that vintage vest and it looks great with the skirt. you are so gorgeous!! YESSSSSSS!!! Loving the colors. That skirt is fantastical! you always put the best outfits together lady... love them! Absolutely love the red on you! I just love the vibe of this outfit. nice outfit! very vintage and oriental looking! Hi, I’ve just post on my blog an article with my favorite outfits for May, you’re in, if you don’t want I can deleted the picture and off course I’ve linked to your blog. Thanks Leah. I love the way you mix and match and style everything so beautifully! The red dress is such a pretty color on you! Gorgeous combo ! You look great ! That dress is so gorgeous! I hope you get some rest love! great outfit! I love the combination of textures! You look amazing, red suits you. I love this so muchhh!! hii love! love the layering on this! so perfect! so pretty!! ps u stay in la? we should grab coffee! Wow, this is effortlessly styled. You look freaking stunning and fabulous as usual! Love this. I love concerts, and Jimmy Eat World sounds fantastic! I'd love to see them live, I'm so jealous! I'm also jealous of your outfit! What an adorable dress! Great style...lovely shots and post! Wow! Absolutely stunning, what an amazing dress, the color looks perfect on you, and I love that you paired it with the oversized vest...perfect music festival attire! fantastic layering! love the bag! cant wait for your blog shop! i loveee that purse! so cute cute cute immages!!! you have this knack for putting together pieces that i would've never thought of pairing together and looking amazing in it! Love you in red hun...Bright bold and beautiful! A nice respite from some of the more muted colors of spring. ahh you saw jimmy eat world! i loved them in jr high/high school too, especially "23" haha such a sadddd breakup song. i think everyone goes through an emo phase as an angsty teen ;) anyway, love the red midi dress on you! great pics :) ur blog is very nice !! You layer things perfectly. Love the colour combinations. Thanks for sharing the photos and drop by me too, soon. GREAT OUTFIT! I LOOOVE THE SKIRT :-)! stunning dress! you rock vintage looks so well :) I'm a huge fan of Jenny from the Block! Your blog is sooo pretty & amazing! you look gorgeous darling!! i love that outfit!! your heels are gorgeous! !and i love that waistcoat over the dress!! your photos are so amazing! I adore your dress... that's such a perfect skirt length - demure but ladylike.. and I totally understand what you mean about blogging being one of those things you can do in the middle of the night..
Also, this is random but I also saw Jimmy Eat World live in Australia last year! They were tight... glad you enjoyed! I love the dress and the bag! They are both so pretty! I really love this look!!! WOAH, DOUBLE TAKE ON THE FIRST PICTURE. Babe babe babe. I mean, I love this outfit. I LOVE IT! IT'S REALLY CUTE! I adore when you wear clothes like these. how beautiful this dress is on you!